E-mails have become an integral part of everyday life. For many years now, this medium has been used as a fast and uncomplicated way to communicate. Nevertheless, aspects that most people do not consider critical in their personal communications can be associated with substantial risks in business communications. As a communications media, e-mail is vulnerable to risks such as monitoring of e-mail content, faking of an e-mail identity, phishing or spam. Users are not always able to detect such threats at first glance. It is possible, for example, for third parties to read or falsify unsecured messages during transport. Furthermore, there is a danger of e-mails being misdirected or imitated without the sender or the recipient ever knowing that it happened. This can cause incalculable damage for both parties. You can look up public keys for Rohde & Schwarz employees via https://securemail.rohde-schwarz.com/requestKey.jsp (see PDF "Secure E-Mail Communications with R&S", section 9). Using this option requires you to first get in touch with your Rohde & Schwarz contact. The communications for TLS/SMTPS are not accomplished using an MX record when exchanging e-mails with Rohde & Schwarz; instead, the dedicated mail system securemail.rohde-schwarz.com (IP: 80.246.41.42) is used. With STARTTLS, the communications take place via TCP port 25. Here, it must be ensured that both ends allow only TLS encryption. With SMTPS, the secure communications take place via TCP port 465. The SSL certificates that are used for the TLS protocol must have been issued by a public certification authority. No user-signed keys will be accepted. The keys must be at least 2048 bits long. The RC4 encryption algorithm is not supported. Session keys must be at least 128 bits long. The common names (CN) of the certificates that are used must correspond to the host names for the corresponding e-mail gateways. The mail server must be operated in your network and must not be hosted externally. 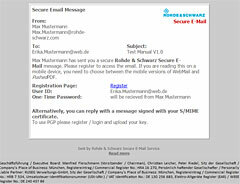 Registration e-Mail for Rohde & Schwarz Secure E-Mail. Subject: "Register to Receive an Encrypted Email"
You will receive the initial ("one-time") password mentioned in the registration e-mail from your communications partner at Rohde & Schwarz. For that task, a different communications channel (such as a telephone call or a letter) is used – for your protection – instead of e-mail. You need the initial password to register on the Rohde & Schwarz Secure E-Mail web interface and read your confidential e-mail there. This registration e-mail is signed with a key that has been issued by the QuoVadis certification authority that Rohde & Schwarz uses. If you are already able to send encrypted e-mails via S/MIME, you can respond to the registration e-mail with a signed e-mail message. The Rohde & Schwarz encryption gateway extracts your public key from the signed message, validates it, and sends you the confidential information in encrypted form by e-mail. If PGP is used, please register on the Rohde & Schwarz Secure E-Mail web interface and upload your public PGP key (see PDF "Secure E-Mail Communications with R&S", section 8). The Rohde & Schwarz Secure E-Mail web interface mailbox is not a permanent archive. Please store your messages and their attachments on your own computer. Old e-mails will be deleted from your mailbox after 90 days. Accounts are deleted regularly after 180 days of inactivity. The maximum storage capacity for your Rohde & Schwarz Secure E-Mail web interface account is 50 Mbyte.